Last month's Petit Vour box was beautifully curated, let me tell you more. 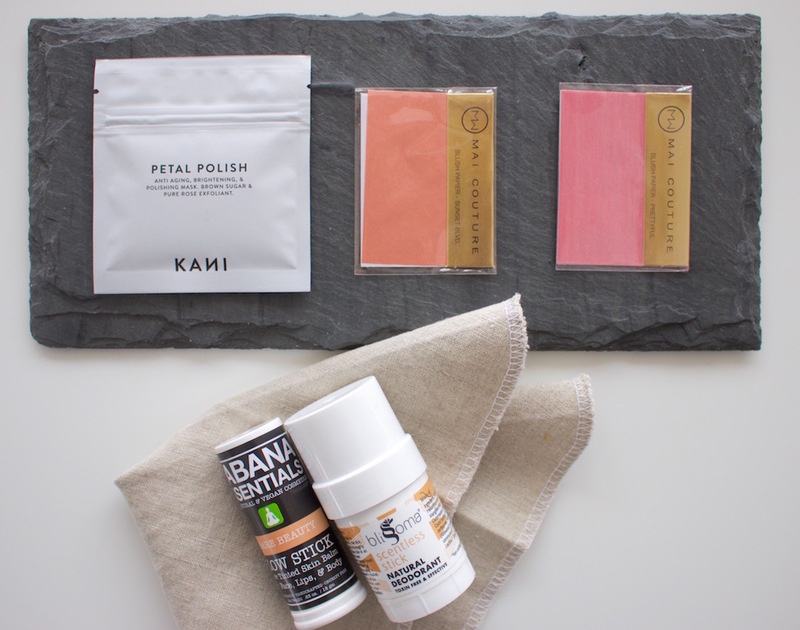 Kani Petal Polish - at first glance i thought this was nail related but nope, its a sweet polishing face mask. Saving this for the end of a long day of travel to slough off the yuck and hydrate my skin at the same time. Mai Couture Blush Sheets - these genius little sheets are perfect to throw in your wallet to brighten up your complexion throughout the day. You know what i'm saving these for.... travel! Zabana Essentials Glow Stick - the first thing i noticed was the delicious nectarine scent and the second was how beautifully smooth it left my skin. Perfect for summer no-makeup days or anyone who wants to add a sheen to their skin. I always love that the PV items are a little higher end and this has to be my favorite one from them yet. You can get your own Petit Vour sub box here.